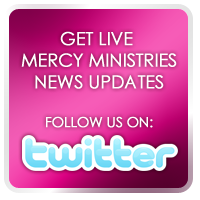 Mercy Ministries News: Mercy Volunteer Invited to the White House! On September 8, 2008, Mercy Ministries volunteer Andrea Ward visited the White House for a celebration in honor of recipients of the Presidential Volunteer Service Award. Mercy Ministries was proud to learn that she would be attending as a representative of the volunteer work she did while at Mercy Ministries. Andrea has a long history with Mercy Ministries that started in 2003 when she moved from Kansas to Tennessee to serve as a full-time volunteer at Mercy for an entire year. After that year, Andrea continued as a part-time volunteer with Mercy logging in a total of over 4,000 volunteer hours! In 2004, she was nominated for the Presidential Volunteer Service Award. Created by President George W. Bush in 2002, this award is given to motivate individuals to become involved in volunteering around the United States with causes that help “bring us closer together as families, as neighbors, as communities and as a nation.” On August 30, 2004, Andrea, along with Mercy Ministries Founder Nancy Alcorn, was invited to meet the President as he stepped off Air Force One, and receive the award. Andrea became interested in healthcare because of Mercy Ministries and desires to become an obstetrician or gynecologist. “My ideal occupation would be to work with Mercy again and work with the residents as their physician,” she said. She is currently attending the University of Tennessee in Knoxville as a full-time student studying biochemistry and cellular and molecular biology. Congratulations Andrea—we are so grateful for your service. We wish you the very best as you go on to pursue medical school.